Ioana Ieronim writes with the perfectionism of a mind always in flight. Her work refuses all the compromises of stasis: over-familiar, laboured thought; a style held hostage by certain rhetorical tics; the too-easy achievements of consensus between the writer and their faithful reader. This polymorphous poet refuses the trap Roland Barthes says distinction sets for the writer, in which authorial identity becomes merely a “brand”. To read a new Ieronim collection is always to embark on a mystery tour full of intense textual pleasure and sensation. I cannot think of another poet of her European generation who displays a similar flexibility; yet Ieronim is both distinguished and distinctive. What, then, is the key to this distinctiveness? It lies in her poetic project itself. As Omnivorous Syllables shows, Ieronim’s poetics always occupy just the territory necessary to formulate her presence in a particular culture or genre. Like Whitman, who informs such American-set pieces as ‘The Portrait of an Artist’, she keeps the line of thought not only moving but alive at all times – sometimes through exclamation, sometimes through a particular openness of diction – in order not merely to keep our attention but to show us something important about what it is to be alive. Motility, Woolf’s “halo of the unconscious”, a Christian “breath of Life”, are all part of this aliveness: they are also elements of a transcendent openness which is Ieronim’s poetic sensibility. For her, the poet is both protagonist and witness, present and yet constantly escaping the self in order to record the sensibilities of other places, other people. Ieronim’s poet, in the striking self-portrait of her ‘Fievre y Candor’, speaks “to us from the many/ open windows of his stanza/ silk and stone”; and she borrows objects and symbols to perform the metaphorical magic of opening those windows with profound freedom and originality: ‘The Line of Life as a Skyscraper’ indeed. Images from contemporary America, an ethnographic Romania and Virgil’s Aeneid are juxtaposed in these poems; and this peculiarly generous relationship to image is indeed profound because, in finding the most unexpected sources for symbol, Ioana Ieronim revivifies not only each particular poetic thought but the art of symbol formation itself. It’s in this movement that the exceptional “flight” of her poetics is to be found. In ‘Reading’, for example, the writer can no longer be recognized by the reader; both are reduced to static figures sticking their heads through cartoon pictures to be photographed... meanwhile, unseen, “words flow down our bodies, stream into the ground/ bitter cold sets aflame the nest of the day” and, in a transubstantiation of metaphor into the real matter of the poem worthy of Rilke, this bitter weather can only improve in a future in which the reader and writer, coupled, “may yet endure”. Even this wonderfully concertinaed example can only begin to indicate how well the serious perspective of the sequence, or series of related poems, suits Ieronim’s writing. There are examples of both in this vibrant, brilliantly-coloured book. 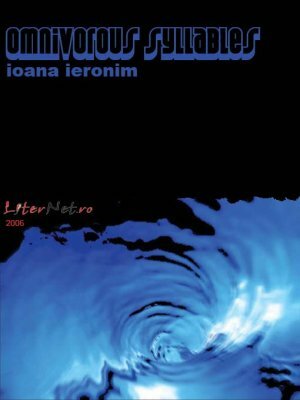 If our “postmodern” zeitgeist is constantly self-interrogating, destabilising, Ioana Ieronim’s Omnivorous Syllables bring an utterly contemporary sensibility, for which “the dodecahedron is the symbol of the world”, to bear on its challenges, excitements, and – as Ieronim uniquely reveals to us – its wild poetries.